The question, of course, is whether that hope is warranted. After all, in his own public statement, Trump made no reference to the two-state solution, and his vague declarations about peace (mentioned 11 times) included not so much as a hint about the need for Israel (also mentioned 11 times) to end its illegal settlement construction. And, in fact, Trump fell back in his statements on that asymmetrical phrasing he has so often used in the past: Israel and the Palestinians. The reality is that Trump has long been giving Palestinians reason to worry. During his election campaign, Trump spoke about moving the United States embassy to Jerusalem and condemned the outgoing Obama administration’s decision to abstain from voting on a United Nations Security Council resolution denouncing Israeli settlements (rather than vetoing it). Once elected, Trump appointed as US ambassador to Israel his bankruptcy lawyer, David Friedman, who has a long history of supporting right-wing Israeli causes (even donating to a West Bank settlement). Yet Abbas was silent about these issues. The mere fact that Trump had invited him to the White House so early in the administration seemed to provide reason for optimism. And Trump had already directed some attention to resolving the Israeli-Palestinian conflict, tasking his son-in-law and trusted (though wholly inexperienced) adviser Jared Kushner with brokering a peace agreement. Of course, promises to broker peace are nothing new for a US president. But Trump is no ordinary US president. Many Palestinians are encouraged by the fact that he does not seem bound by the usual lobby-influenced ideologies and commitments of US political parties. 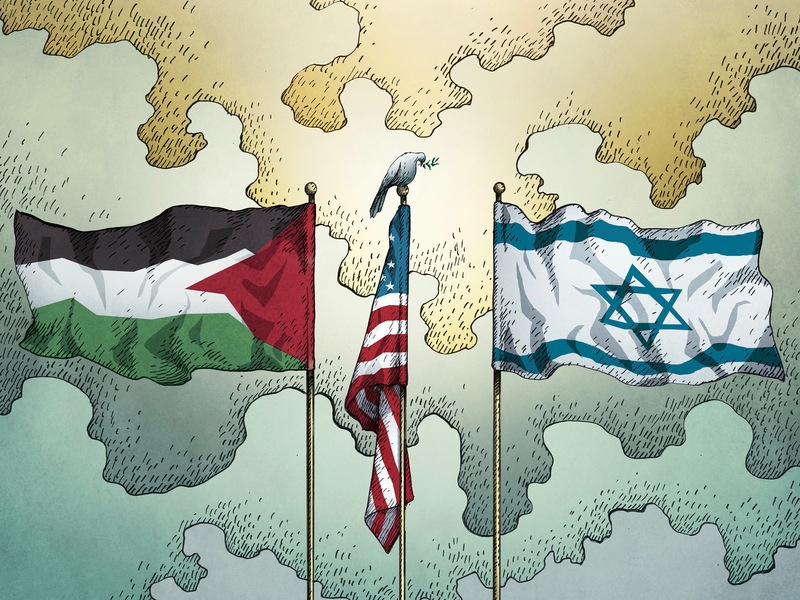 In their view, a US president who puts “America first” surely will see the absurdity of spending so much political and financial capital on Israel, which provides little strategic benefit to the US, at the cost of greater instability in the Middle East. Trump’s image as a deal maker reinforces this hopeful narrative. While his promises to strike “the ultimate deal” are not backed by much detail, they remain appealing to Palestinians, who have grown frustrated with a peace process that has had little impact beyond allowing Israel to expand and consolidate its occupation of Palestinian land. This is not to say that Palestinians blindly trust the Trump administration to determine their fate. On the contrary, Abbas has worked diligently to strengthen his own position, meeting with Egyptian President Abdel Fattah el-Sisi and Jordanian King Abdullah II five times between Trump’s inauguration and the visit to the White House. When Sisi and Abdullah visited Trump, each reiterated the position included in the 2002 Arab Peace Initiative: Israel should withdraw fully from the occupied territories, in exchange for normalization of relations with Arab League countries. At the March 29 Arab League summit in Jordan, they and other Arab leaders underscored the need for an independent Palestinian state on the 1967 borders, with East Jerusalem as its capital. With such efforts, Abbas hoped to underscore the real goals that must be pursued, countering Israeli attempts at diversion. For example, Israeli Prime Minister Binyamin Netanyahu has been calling on the Palestinian Authority to halt social benefits to the families of prisoners who killed Israelis, attempting to portray those allocations as some kind of payoff. Abbas’s praise of Trump at the White House may be another tactic for keeping Trump on track. It is too early to tell if Abbas’s approach to the Trump administration will succeed. Some might argue that Trump’s decision to make Saudi Arabia, rather than Israel, the destination of his first trip abroad as US president reflects a new view of the region (though he will head to Israel immediately after). When interviewed by Reuters on his first 100 days in office, Trump said that the US presidency had turned out to be a much harder job than he had anticipated. But the negotiations between Israelis and Palestinians need not be. After all, we know what a deal must entail: an independent Palestinian state, secured through land swaps, and a creative solution to the Palestinian refugee issue. Daoud Kuttab, a former professor at Princeton University and the founder and former director of the Institute of Modern Media at Al-Quds University in Ramallah, is a leading activist for media freedom in the Middle East.